Kementerian Perencanaan Pembangunan Nasional/ Badan Perencanaan Pembangunan Nasional - Kementerian PPN/BAPPENAS is the Ministry of National Development Planning of Republic of Indonesia. Kementerian PPN/BAPPENAS is a ministry in the Indonesian Working Cabinet (Kabinet Kerja) with main task to formulate the national development planning. 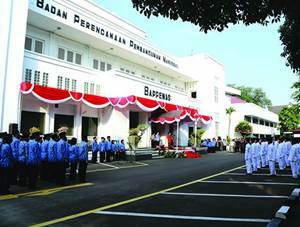 To carry out its duties, the Ministry was supported by Badan Perencanaan Pembangunan Nasional (BAPPENAS) or the National Development Planning Agency, an Indonesian state agency with main duties to formulate national development planning in Indonesia, including annual planning, five-years planning, and long-term planning. BAPPENAS also has a duty to coordinate foreign development cooperation, both bilateral and multilateral. According to information found in the Ministry's website, the organization structure of Kementerian PPN/BAPPENAS consist of 9 deputies, 1 main secretariat, 1 main inspectorate and 2 center units. Since 27 July 2016, Bambang Permadi Soemantri Brodjonegoro was appointed by the President Joko "Jokowi" Widodo as the minister of National Development Planning and the Chief of BAPPENAS in the Indonesian Working Cabinet (Kabinet Kerja) to replace Sofyan Djalil. Arrange an essays with themes "Strategy for implementing regional development evaluations in 34 provinces". JobsCDC.com now available on android device. Download now on Google Play here. Please be aware of recruitment fraud. The entire stage of this selection process is free of charge. 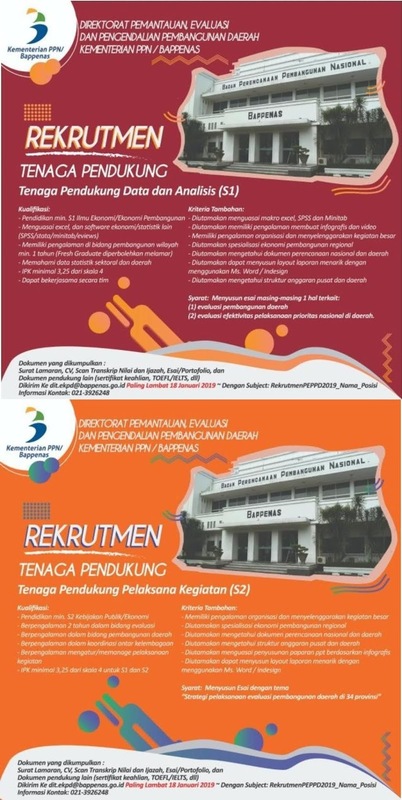 Kementerian PPN/BAPPENAS - Supporting Staff Non CPNS BAPPENAS January 2019 will never ask for fees or upfront payments for any purposes during the recruitment process such as transportation and accommodation.